My neighbor wanted to share with me. What did she want to share? 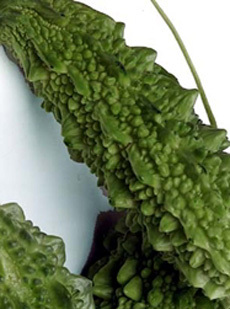 Some bitter gourd, also known as bitter melon. Whatever you want to call it, it looks like a bumpy cucumber and it tastes...bitter. Awful bitter. But she'd fried it to death and I almost couldn't make out the bitterness--it did catch up to me later, though, and stay with me for hours. She explained all the bitter gourd's good health properties to me. Good for thinning the blood, diabetes, something something. And she sent some home with me. I tried to convince someone else to eat these treats for me. You know, a cultural experience and all. Eat the bitter gourd to say you've tried it. My neighbor waved at me from the balcony today and said to come over. I wonder what she'll have for me to try next. Resembling a bumpy cucumber, Indian Bitter Melon is much smaller than Chinese Bitter Melon, only 4 to 5 inches in length. The grooved yellow-green to dark-green skin holds a fibrous, seed-filled core. The lighter the color, the milder the taste. Its slightly sour flavor becomes quite bitter upon ripening. This bitter or quinine flavor is often combined with garlic or chili. It is used in soups, curries, stir-fry, or can be steamed and braised. haha. you cannot become a burned bitter gourd tasting salesperson. i think you may have already attained higher accolades than that however. Maybe next time I'll mail it to you to eat. Hide it in your sticky buns.